Today, I will be concluding Scotchvember on Thanksgiving with a review of a wonderfully warming Islay single malt, Ardbeg Uigeadail. Ever since Jim Murray awarded this the greatest whisky in the world in 2009, much has been made about this highly-awarded single malt. Before I get too far into my opinion on Uigeadail, what exactly is “Uigeadail?” The name of the whisky comes from the loch where Ardbeg gets its peaty water supply. There is no age statement on the whisky itself, but I have heard that most of the spirit is between seven and twelve years old. The whisky in the bottle is a vatting of whisky aged in Oloroso Sherry casks, first-fill bourbon casks, and refill bourbon casks. According to Ardbeg’s Distillery Manager, Mickey Heads, most batches of Uigeadail are comprised of approximately 20% sherried spirit, with the rest of the whisky being divided between first and second fill bourbon casks. Uigeadail is non-chill filtered and bottled at 108.4 proof (54.2% abv). On the nose, Ardbeg Uigeadail presents that famous Ardbeg peat, but that is not all. There are also notes of mesquite BBQ sauce, asphalt, and mocha. There is a dark sweetness that works beautifully with the peat on the nose. The palate, however, is where this whisky truly comes alive. The palate is full-bodied with a brilliant balance between sweet and peat. The luscious, rolling peat is present throughout the palate, but it is rounded out beautifully by honey, vanilla, raisins, and dried mangos. The finish is long and complex, starting out peaty, and then evolving into sweet, dark cigar tobacco (Maduro) and black coffee. Water brings out sweeter flavors in the nose, such as roses and honeysuckle, while bringing forth dark chocolate and sherry on the palate. This whisky continues to evolve as I go through the bottle and as I add water to the glass. Different flavors come alive with each drop of water, but I love this whisky most at its full bottle strength. The complexity and balance is superb throughout the sip at a level few whiskies can seek to achieve. I truly believe this is one of the finest whiskies I have ever had the pleasure of enjoying. 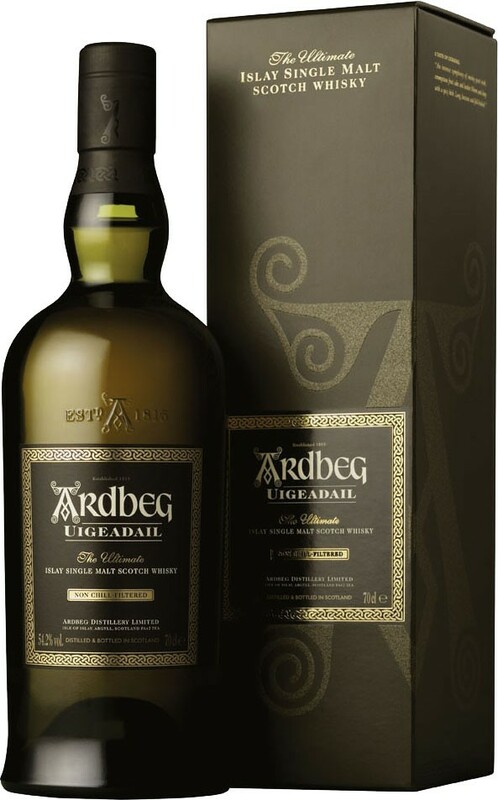 If you love peat, Ardbeg Uigeadail is the pinnacle of peat and cask influence in a young, affordable Islay whisky. My grade: A/A+. Price: $70-80/750ml. The price makes this a reasonable dram, and the whisky in the bottle screams to be unleashed on the most special of occasions. With the sea in the background, Old Pulteney has one of the most visually appealing bottles coming out of Scotland. Today, Scotchvember rolls on with a review of Old Pulteney 12 yr., as well as marking another tandem review with my friend William from A Dram Good Time. Pulteney is the northernmost distillery on the Scottish mainland, located on the northeast Scottish coast in the fishing town of Wick. The distillery is somewhat famous for the fact that the stills both have very large balls towards the top (a design imitated by the Old Pulteney bottle), encouraging a lot of reflux. The finished product is a very oily spirit, similar to that of Scapa. Old Pulteney 12 yr. is the entry level malt from the distillery, aged entirely in ex-bourbon casks, and bottled at 86 proof (43%abv). On the nose, Old Pulteney is especially fruity in flavor and oily in texture. The fruit notes remind me most of pears and red apples, but the nose also yields barley, sea salt, and light floral notes. The palate is the highlight of this whisky for me, though. It is medium-bodied, with notes of pear, peach, sea salt, strawberry, and warming oak. The finish is medium in length, but still warming and pleasant, with very good balance between saltiness and orchard fruits lingering on the palate. Overall, I am definitely a fan of Old Pulteney 12 yr. It is an accessible malt that still packs plenty of complexity for all whisky drinkers to enjoy. I would love to see what this whisky would achieve at a higher abv, but as it is, this is still very good whisky. The 12 year-old expression of Old Pulteney is also a very spry malt, still very much alive. I am curious to try some older Old Pulteney malts to see how the spirit handles the extra wood. My grade: B+. Price: $35-40/750ml. For the price, this single malt is very hard to beat. 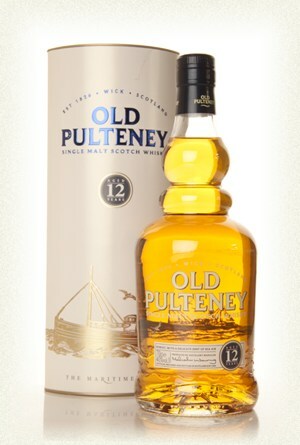 If you are in a seafaring mood, but don’t care for peated whiskies, give Old Pulteney a try and let it ride! Here are William’s tasting notes and a link to his review here. Nose: Bright, fruity and lightly floral – Apple, pear, vanilla, paraffin, honey, some light coastal qualities – brine, seas air – honeysuckle now and caramel. Palate: Slightly oily mouthfeel and again full of fresh fruits and light floral qualities – Apple, honey, sweet grain, brine, ginger, caramel and just a touch of citrus. Finish: Moderate with ginger and sea-sprayed fruits. Overall this Pulteney is aligned quite nicely with its aromas and makes for a great ‘anytime sipper.’ Its coastal influences also make it an excellent introductory whisky for those wishing to branch off into something a little different but still want to stay in the light and fruity side of single malts. It also shows just how broad of a range there is in regards to Highland whiskies. Scotchvember is almost at an end, but fear not, I’ll be finishing up with some delightful drams. First up in the closing stretch is Glenfarclas 10 year-old. Glenfarclas is a family-owned distillery in the Speyside valley of Scotland, notable for their sherried style, and their dedication to single malts. Glenfarclas is one of the few Scottish distilleries still owned by the family that owned it 100 years ago. In fact, the Grants of Glenfarclas purchased the distillery in 1865, and still own it today. Very little in production has changed over the years at Glenfarclas, which is also unique among Scottish distilleries. Personally, I have not dabbled into much of the Glenfarclas range, but their whiskies are always reasonably priced for single malts, and I suspect that there will be more Glenfarclas reviews on Bargain Bourbon in the future. 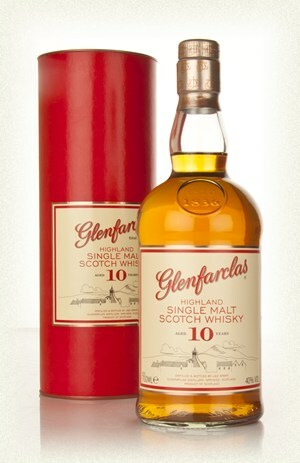 The Glenfarclas 10 year-old is aged in ex-sherry casks and bottled at 80 proof (40%abv). The nose on this whisky is sweet and perfumey, reminding me a lot of apples or a hard cider. There is a distinct (but pleasant) bitterness to the nose, all backed up by sweet orchard fruits and honey. The palate continues the sweetness, with a creamy entry of honey and apple cider. The finish is medium-long and quite dry with those same tart apple notes present throughout the whisky. With water, Glenfarclas 10 year-old begins to show its sherried qualities more. Water brings out a nuttier palate, along with some raisin and marzipan notes on the finish. Overall, this is a wonderful whisky that unfolds very nicely with water and time. I suspect (only judging by the whisky, itself) that the Glenfarclas 10 year-old is aged primarily in refilled sherry casks, as the sherried flavors are subdued in this whisky. Tasted blind, I highly doubt I would have guessed there was much more than 25% sherried whisky in this bottle. All that said, Glenfarclas 10 year-old is a spry, young whisky that packs good complexity into a drinkable, delicious dram. My grade: B. Price: $45-50/750ml. In some less expensive locations than Boston, this whisky is available at a very good price, making it a very good bargain buy especially for the holidays. Today, I am continuing Scotchvember at Bargain Bourbon with a review of Ardmore Traditional Cask. Ardmore is a unique distillery because it hardly fits the flavor profile of its region. As I discussed in my review of some McClelland’s whiskies, each Scotch region tends towards a specific flavor profile. Ardmore is usually considered to be within the Speyside region of Scotland (even though Ardmore considers itself a “Highland Single Malt”). Speyside is the most popular Scotch region, known for soft, elegant, fruity, and malty whiskies. Speyside has the highest concentration of distilleries in Scotland, and the three most popular single malts in the world (Glenfiddich, The Glenlivet, and The Macallan) all hail from Speyside. What sets Ardmore apart is that it is smoky and peaty, much more reminiscent of an Islay Scotch than it is of a Speysider. Ardmore Traditional Cask is the standard entry-level offering from the distillery, and it is aged in ex-bourbon casks for about 6-8 years, and then finished in quarter casks (125 liters) for an extra period before aging. There is no age statement on the bottle, but most of the whisky in the bottle will be about 8 years old. If the process sounds similar to Laphroaig Quarter Cask, it is. In fact, both distilleries are owned by the same parent company, Beam Global. 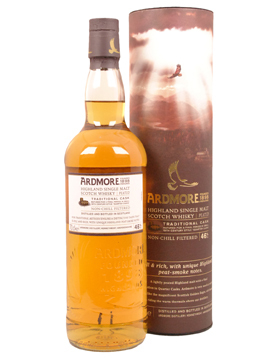 Ardmore Traditional Cask is non-chill filtered and bottled at 92 proof (46 % abv). On the nose, this whisky has a medium peat backbone (not quite the dense peat of Laphroaig, for example), with a nice rounded sweetness in the form of honey and vanilla. The palate is medium-bodied and creamy with a lot of sweet flavors, like brown sugar, honey, and vanilla all wrapped up in a warming peat smoke. The finish is medium-long and fairly drying. 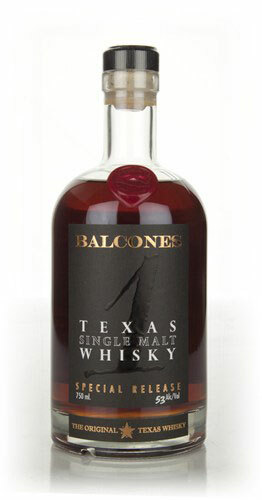 There is a woody tannic bite that comes in on the finish, but those pleasant sweet flavors from the palate are still present. There is definitely a lot influence from the bourbon casks in this one, which is allowed to shine through a more gentle peat than in Ardbeg or Laphroaig. Overall, Ardmore is a lighter, softer take on a peated whisky. It does drink a little young, but it is still a very pleasant pour. Ardmore offers new drinkers a great introduction to peated whisky without knocking all the wind out of your palate, nor is it an especially deep whisky. Despite its youth, Ardmore drinks well below its elevated proof point, making for a warming, yet delicate dram. My grade: B. Price: $25-30/750ml. At the price point, Ardmore Traditional Cask is a fantastic value whisky, well worth letting it ride on this peated Speysider.